The sound of the watermelon cracking at your first cut is usually a sign that a treat is in store. Filled to nearly bursting with juices, flavor and a healthy dose of antioxidants, the fresh, crisp melon simply boasts of summer and has everyone in the kitchen hovering for that first taste. 1 Carve into basket the whole watermelon and remove all watermelon meat inside and cut into chunks and set aside. 2 Combine tomato, watermelon, kesong puti, arugula, fresh basil and toss in bowl with Balsamic vinegar, extra virgin oil and honey. Season with salt and pepper. 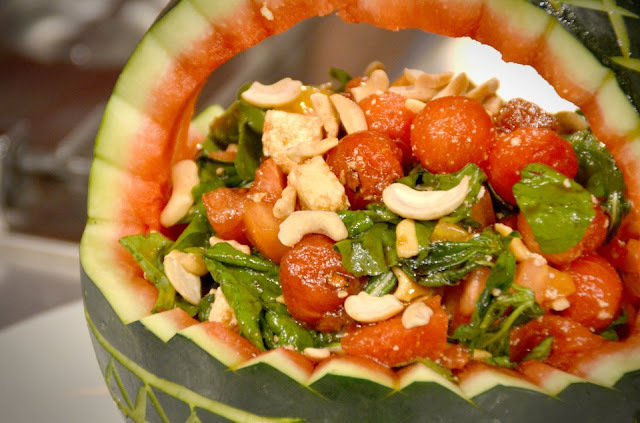 3 Fill carved watermelon basket with combined mixture of melon, tomato, kesong puti, and arugula. Top with roasted cashew nuts.